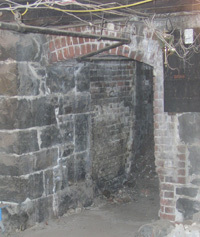 Yes, the Shanghai Tunnels of Portland existed. Today, Jones is nearly half a century older but still fascinated with the history lesson he learned in the basements of Old Town/Chinatown. Combining oral histories with archeological evidence, Jones has pieced together the buried stories of Portland's early days. Now he shares what he has found with interested visitors on his "Portland Underground Tours." What are the tunnels like? On a recent Friday evening, Jones leads 20 visitors along NW 2nd Avenue to a conspicuous door in the wall of a brick building. As all wait anxiously Jones slowly unlocks the door to reveal a long, steep flight of stairs leading down into the dark cellar of the former Old North End Hotel. With flashlights on, the group descends the stairs and plunges into the 1870s. Thoroughly enjoying the intrigue, Jones describes what they would have found had they had suffered the misfortune of entering this cellar in the Victorian era. Back then, he says, ship captains from around the world put into Portland looking for fresh crews. A handful of crooked middlemen serviced the ships by drugging pubgoers upstairs, dropping them through the floor, carting them through tunnels out to the waterfront, then selling them to captains at $50 a head. In the parlance of the time, this was called being "Shanghaied." Showing a reconstructed trapdoor, Jones demonstrates how quickly a drinking buddy could disappear from his place at the bar, and land below. Jones says "If you were standing in the right place at the wrong time, you could be on a ship bound for China and not make it back for three to six years." Jones enjoys the look of shock on many tour participants' faces. As his brochure states, the tour is, after all, "Educational, intriguing, shocking, yet entertaining." But his well-rehearsed shtick is based on some serious research. The tours grew out of archeological digging which he started seven years ago. "I had no intention of doing tours. I was just digging for historical information. But, then people kept asking if they could see what we were finding." Jones has a talent for making people see more than they would usually notice. Trapdoors, tunnels openings, holding cells with bars, doors with locks to keep people in rather than out - it is all to be found if only people will look. And listen. "Working on a historical dig is not instant. We hit dead ends sometimes," says Jones. "I listen to oral histories and break through by following the leads." Oral history is an integral part of his Jones's work. According to his sources, eccentric characters filled these dark passages, from missionaries fighting for the souls of drunken seamen to unscrupulous white slave traders who would just as soon sell a dead man as a live one. "When you gather history, folklore comes with it. I collect stories when I collect history," says Jones. He fills in the shadows of Portland's underground with the descriptions of opium dens, police raids, brothels and rollicking bars that were passed on to him by many folks who have since passed on themselves. Whether you are enjoy learning about the obscure or just like something a little out of the ordinary, the underground tours are great fun. And after seeing the subterranean world through Jones's eyes, you may start looking at your grandmother's basement a little differently. WHERE: Tours depart from Hobo's Restaurant, 120 NW Third Ave. WHEN: Every Friday and Saturday night. Visits other nights can be arranged for groups. PRICE: $12 for adults. Children under 12 are $7 (but the 90-minute program may be too much for most young children's attention spans. FOR MORE INFO: Call 503-622-4798 to learn more. TOUR TIP: For the full experience, down a drink before the tour at Hobo's Bar, which was known as the Lasso Saloon in Shanghaiing days. Just make sure you are standing on solid ground before you take a drink.